It has been almost two weeks since France began a military intervention to help the Malian army fight Islamist groups controlling the north of the country. The operation — code-named ‘Serval’ — was sparked by the ‘serious deterioration of the situation’ in Mali, after successful offensives by extremists who managed to take over the city of Konna, ‘a frontier town that had been the de facto line of government control’. The action of France, coming about after months of lengthy negotiations attempting to resolve the crisis in Mali, has been overall welcomed by the international community, and reportedly relatively successful in pushing back Islamists. In terms of international law, the military operation raises a number of issues, two aspects of which this blog post will address: the responsibility for maintaining peace, and the responsibility during the conduct of war. France has repeatedly stated that it was acting in accordance with international law, referring to UN Security Council Resolutions, Mali’s request, and/or Article 51 of the UN Charter to support its claim, but fell short of elaborating which specific legal ground was actually justifying its operation. To begin with, French actions cannot be said to fall within the ambit of UNSC Resolution 2085, which authorized on 20 December 2012 the deployment of an international military force in Mali. Resolution 2085 indeed authorized an African-led International Support Mission in Mali (AFISMA), to be composed of troops from member States of the AU and ECOWAS and other countries in the region. Besides, the Resolution states that ‘the military planning will need to be further refined before the commencement of the offensive operation’. The fact that the UN Secretary-General expressed the hope that the intervention would be ‘consistent with the spirit’ of UNSC Resolutions only confirms that the French operation is not based on any of them. Although authorized by the UN, the deployment of the AFISMA has been protracted inasmuch as the force ‘was not expected to even begin its offensive before next September or October’. In this context, the French operation was a very swift answer to an urgent call for help from the Malian government, at a time where troops from neighboring States were not in the position to rapidly react. This request by Mali is actually what justifies best the use of force by France. Indeed, pursuant to Article 20 of the ILC Articles on the Responsibility of States for Internationally Wrongful Acts (ASR), valid consent from a State ‘precludes the wrongfulness of that act in relation to’ this State. Accordingly, since Mali solicited France to use force in its territory, the forceful action otherwise wrongful became justified. Some doubts have been raised as to whether the consent expressed by the current Government of Mali, an interim government in place since only a few months and established in the wake of a military coup, can qualify as ‘valid’ in the sense of Article 20 ASR. The legitimacy of a government is indeed an element to be considered in appraising the validity of consent according to ILC commentary to Article 20 (para 5); yet the notion is far from having a settled meaning in international law and rather depends on the perceptions of each State. An unequivocal appraisal of the legitimacy of the Malian Government would be difficult and does not appear necessary for the purpose of Article 20 ASR. What can be demonstrated is that a number of States — which positively considered Mali’s request — are of the opinion that the Government is, so to speak, ‘legitimate enough’ to demand an intervention. Indeed, Mali’s interim President Traoré was admittedly not elected, but was appointed with relative international support, notably from ECOWAS. Besides, the local population has appeared very favorable to the military operation since its inception, confirming the legitimacy of the Government’s consent. In such a situation of requested intervention within an internal conflict, Article 2(4) of the UN Charter, which prohibits the use of force between States, actually ‘does not come into play’. The absence of inter-State conflict is also why the argument of (collective) self-defense — notably advanced before the UNSC by the Permanent Representative of France to the UN ­— ought to be discarded. As rightly demonstrated by Prof. Christakis and Dr. Bannelier on EJIL:Talk!, it does not make sense to interpret Article 51 of the UN Charter so as to include self-defense against rebel groups in northern Mali. The operation thus appears justified, and has been overall widely praised by the international community given the urgency of the situation. This formal support however stands in sharp contrast with the very limited concrete support contributed to the operation. A number of Western States have expressed their willingness to contribute logistical support, but none has offered to participate in combat operations. The UK, for instance, has agreed to make transport aircrafts available to France, and even sent a few troops charged with providing strategic support, but stressed that no troops will be deployed in combat operations. 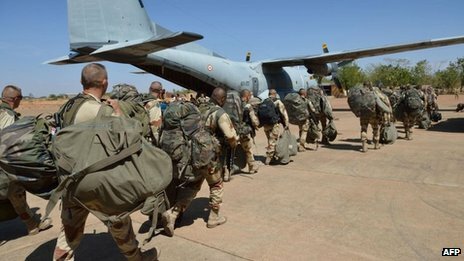 Belgium, Canada, Denmark, Germany and the US are amongst the other States which deployed transport planes to help transporting French equipment and troops to Mali. The EU has accelerated the approval of a EU Training Mission (EUTM), but its troops will be focused on training the Malian army, and will not directly help fighting rebels. As mentioned above, African States have the willingness to participate but have a limited capacity to deploy their troops in haste. Many of them confirmed their commitment to send troops for the AFISMA, but ‘even if some troops arrive in Mali soon, training will take more time’, so that help from States able to quickly react is needed until the peacekeeping force is fully deployed. The various contributions provided are useful and welcome. It is nonetheless striking that most international actors support the intervention, but none of them want to get dirty hands by actually going to war. In other words, many States seem unwilling to share the burden of restoring peace in the area. In his 2004 Report ‘A more secure world: our shared responsibility’, the UN Secretary-General insisted that ‘States should strongly support’ and broadly participate in efforts to effectively implement the system of collective security. Whether to participate in a military operation aimed at restoring peace is, in any case, a decision that a State is free to make, so that no strict obligation to engage in a war can be formulated. But the collective duty to ensure that peace is maintained in the world is shared by all States. As long as States remain the only actors with military capacities, the aims of this shared duty can only be achieved by increasing cooperation and promoting a wider participation of States. For those States which decide to actively engage in the conflict comes the risk of having their responsibility engaged for internationally wrongful acts. Responsibility in this strict sense refers to the obligation of reparation incurred by a State when a breach of international law is attributable to it. Some allegations of possible wrongful acts in Mali have been made, concerning summary executions by Malian armed forces and civilian deaths resulting from French air strikes. In this military operation, France and Mali are fighting together against Islamist groups. In terms of attribution, the question arises whether their acts can be individually attributed or ought to be attributed to both. Although cooperating at the strategic level, French and Malian actions have been up to now clearly separable. The armed forces remain under national command with no unified command over both forces, so that every organ remains fully under the authority of its State. Besides, the two States have at first not engaged in common operations. To retake the town of Diabaly, Malian forces fought on the ground, with French forces ‘providing only air support’, and control of the Gao airport was taken by French ground forces acting alone. In these circumstances, wrongful acts occurring in the operations can be individually attributed to each State under Article 4 ASR. Complicating factors are however likely to emerge. 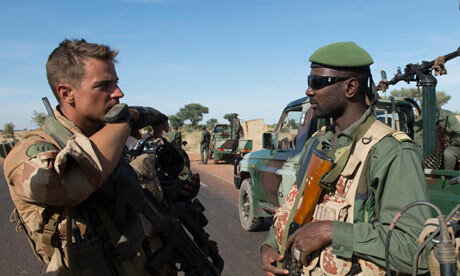 For instance, French and Malian troops could conduct joint operations. It is debated whether a specific conduct alleged as wrongful can be attributed to two States on the ground that they were jointly acting. Article 47 ASR recognizes that the same internationally wrongful act can be attributed to more than one State, and joint acts are one of the circumstances of possible dual attribution mentioned by the ILC in its commentary to this Article. But unless two soldiers pull the trigger together, it can often be argued that a conduct is individually attributed to the State whose organ was acting. Another layer of complexity is to be added with the progressive arrival of forces composing the AFISMA, as well as troops part of the EUTM. The command structures of the each mission will remain distinct, but they will certainly cooperate and possibly contribute to common injuries. The difficulty in such a situation would be to assess the amount of damages to be paid by each responsible party. In time to come, the multiplicity of actors involved in the conflict will raise complex questions of responsibility, which will assuredly be further discussed on this blog. Y. Dinstein, War, Aggression and Self-Defence (5th edn, 2011), p 119. A more secure world: Our shared responsibility – Report of the Secretary-General’s High-Level Panel on Threats, Challenges and Change (2004), p 69.